GREAT for Cricut Personal Electronic Cutter. This is the #1 CD for SIGN MAKERS! It's the only CD you will ever need! 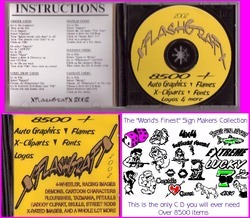 This BRAND NEW XFlashGraFX CD Contains over 8500 items! 1200 High Quality Digitized Images in Vector .EPS & .Ai Format. No crazy programs to install. Nothing to do but import or merge the image into your program. Each image can be enlarged to any size for Cutting, Plotting, Printing, Drawing, Routing Engraving or whatever. This CD contains all the most popular "MONEY MAKING" Swap Meet Graphics like: Cartoons, Bulldogs, "Calvans", Bad Boyz, Bad Girlz, South Parks, Skulls, Sports, Boating, Flames, COOL Sayings, Flags, Racing and Car Related items & more. Please note, viewer is not included in the software. WHAT ? YOU want MORE! OK, you got MORE, OVER 400 FONTS how�s that! WHY SPEND WEEKS JUST TRYING TO SCAN AND CLEAN FOR CUTTING. NOW YOU CAN GET IT ALL on 1 CD! Just merge ot import the images from the cd into your design program, nothing to install, no pre viewer included. Every image you will ever need for cars trucks, signs & more! It�s Awesome! This CD will pay for itself with the first job you do! CANADA S&H is $19.99 USD + $195 USD INSURANCE "REQUIRED" PLEASE, if you do not agree w/ the CANADA S&H&INS. cost, PLEASE do not buy this item. This shipping method & cost is the only way we can ship this item and be covered bu eBays overseas rules, and be sure that the item arrives in your hands in CANADA. ***ALSO NOTE*** if the wrong S&H amount is sent your payment will be returned and your order will be delayed untill the correct amout is paid. FREE U.S.A. SHIPPING INSURANCE: (+ $1.95 for $50.00 insurance, $50.01 to $100 insurance is $2.30 and $100.01 to $200 is $3.35 "Optional") * * * Insurance is buyers option and at buyers expense and is to protect against damage and any claims that the post office "LOST or BENT" the package. Insurance is only $1.95 & recommended! NO IF ands or BUTS, we have no control over what the Post Office does w/ the package once we hand it over to them. Please don't ask us to replace packages that the POST OFFICE LOST or DAMAGED if you don't pay for the insurance, all Postal Rules will apply for Insurance claims. We need to receive YOUR NAME & ADDRESS w/in 24 hours form purchase. We must receive payment within 7 days of purchase to post "POSITIVE FEEDBACK" for YOU, or else we turn it over to PayPal for NON PAYMENT! It�s simple! You purchase you PAY! By clicking BUY this item you agree that you have READ ALL of our RULES and agree with all of them before buying, if not please do not purchase this item. All sales are final. NO REFUNDS! N.J. law requires US to collect current sales tax % for any deliveries made within the state of N.J. ** NOTE ** Please READ & AGREED TO ALL OUR RULES before Buying! $19.99 OUT of the USA S&H+Ins.